We are encouraged that President Rouhani received from the Iranian people a mandate to pursue a more moderate course, and given President Rouhani’s stated commitment to reach an agreement, I am directing John Kerry to pursue this effort with the Iranian government in close cooperation with the European Union, the United Kingdom, France, Germany, Russia and China. Naturally, the mainstream media is seized with joy that Obama is embracing the “moderate�? Iranian leader. The Los Angeles Times declares “President Obama, at United Nations, seeks 'diplomatic path' with Iran�? and ABC News exclaims “At UN, Obama Welcomes Signs of Iranian Moderation.�? 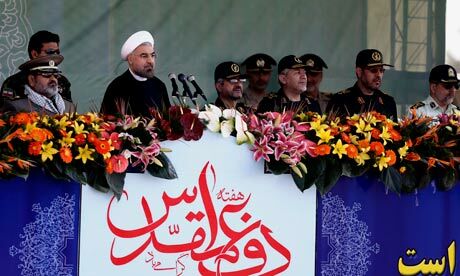 But is Iran’s new president Hassan Rouhani really moderate? Not so much. Don’t be fooled by Hassan Rouhani’s guise and his words of temperance, which mask a history of unabashed fanatical Islamic radicalism. In a matter of weeks after the announcement of Rouhani’s bid for candidacy, he was suddenly pegged as a “moderate�? and “reformer.�? […] In the blink of an eye, his history of deceiving the international community, supporting international terror and oppressing Iran’s citizens, disappeared from the headlines and common discourse. “These students are too pathetic and worthless for us to have to begin changing our directives. The continuance of this mess is not acceptable for our regime and the people. I issued strict orders against these elements [the students] to confront and severely deal with these opportunists. Wherever they are, we will handle them and suppress them. People will witness what today's security and disciplinary forces, the heroic members of the Basij (auxiliary militia) will do to these rabble-rousers and thugs, if they dare to imagine that they can continue their so-called peaceful campaign. The agent that has united our people today, is simply indestructible; that agent is Islam and Islamic rule which is the absolute symbol of the Supreme Leadership.�? And how did the regime forces, under the order of Rouhani, “handle�? and “suppress�? the students? According to Farahanipour, “many students were being shot to death in their dormitories or thrown out of their windows, I was thrown into solitary confinement.�? “While we were talking with the Europeans in Tehran, we were [simultaneously] installing equipment in parts of the [nuclear] facility in Isfahan, but we still had a long way to go to accomplish the project. In fact, by creating a tranquil environment, we were able to finish the work in Isfahan.�? “No doubt, your tireless and dedicated efforts and those of Hezbollah warriors on the scene of resistance promise the decisive victory of the resistant Lebanese and Palestinian nations over the Zionist regime, which has always been supported by the Islamic Republic.�? Support for terrorist groups… Moderate? “The Islamic Republic of Iran aims to strengthen its relations with Syria and will stand by it in facing all challenges... The deep, strategic and historic relations between the people of Syria and Iran ... will not be shaken by any force in the world.�? In his speech to the United Nations, President Obama said, “President Rouhani has just recently reiterated that the Islamic republic will never develop a nuclear weapon.�? If Obama believes this statement, why doesn’t he believe Rouhani’s previous statements, above? And why doesn’t the media? Murder and repression, lying and cheating, support for terrorist groups, backing brutal dictators... Where’s the coverage? Rouhani at the annual military parade in Tehran with some of his moderate friends. Hitler made the trains run on time. Where have we seen this scenario before? Certainly not too far back in our history, but Obama and his supporters don't seem to learn from that.